BMSB populations are significantly higher than last year and unsprayed fruit is already damaged. Fruit harvested (mid-season assessment) around July 4 in a research trial under light management had very early season injury as well as recent feeding damage. Some of this is due to the wet June we experienced which reduced the effectiveness of treatments, but this is compounded by high populations. The ranking of materials can be found in previous posts or in the Rutgers Tree Fruit Production Guide utilizing a short interval between sprays. It is anticipated that two good BMSB chemicals Bifenthrin/Brigade and Scorpion/Venom will be available at effective rates shortly once the Sect. 18 request has been filled. The maximum rate of Belay has shown good results as has Endigo in last year’s trials at RAREC. Always follow label instructions. Kris Holmstrom of Rutgers Vegetable IPM program develops a weekly map of BMSB catches in black light traps. We have been monitoring BMSB in black light traps at vegetable farms throughout NJ since 2004. This has proven to be a great resource for identifying the spread of BMSB. From 2004 through 2011, BMSB spread at a rate of 2.84 new farms each year and is now spread throughout NJ. The black lights work to attract BMSB adults flying at night. They mistake the trap for the moon and get caught. We have been able to correlate trap captures with key periods of flight activity, such as development of the 1st generation adults and large movements between crops. In late May/early June, early catches tell us that BMSB is active on the farm and coincides with the beginning of egg laying. Currently, these traps tell us about the activity of BMSB in the landscape, not on specific crops. We are working to identify what trap captures mean in terms of management decisions. In the meantime, if there is an increase in BMSB catches in your area it is a good indication of activity in a crop and the possibly need for management decisions. As Kris develops these maps each week, I will distribute them to the fruit growers. 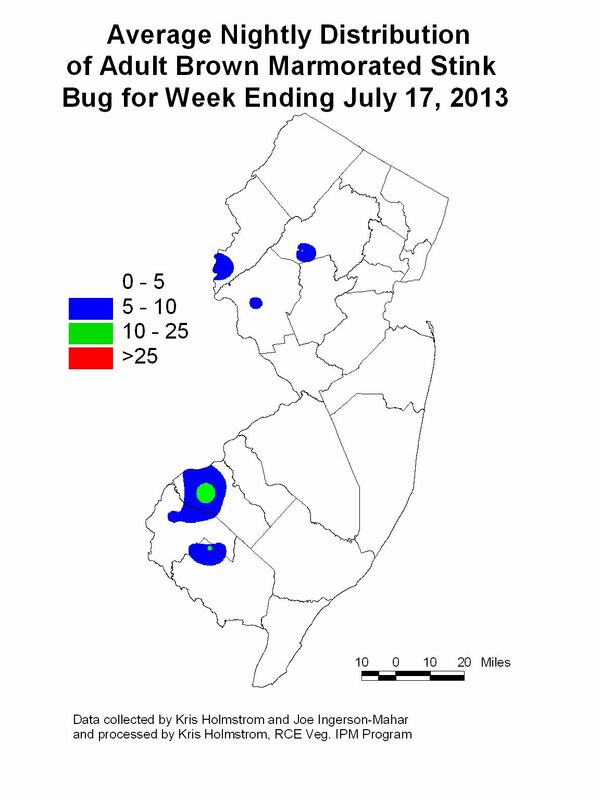 This week’s map shows that activity in southern NJ has picked up as well as some spots in northern farms – a trend that I anticipate to increase.